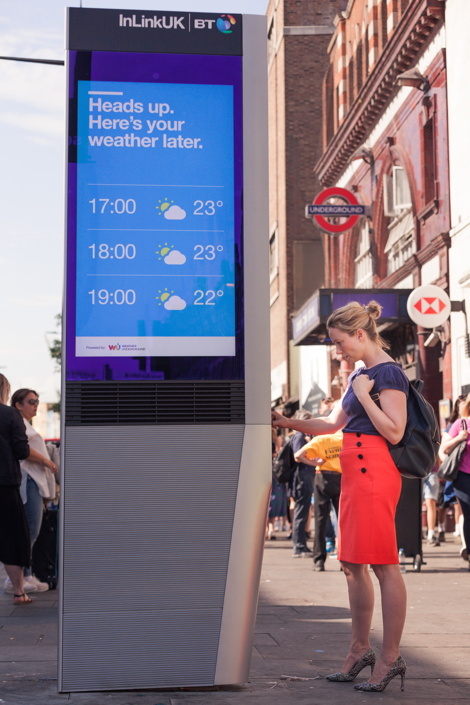 Previously known as LinkUK, the joint venture between BT, Primesight and Intersection in the UK has chosen to update its name to InLinkUK to create a distinctive brand in the UK market (they are obviously ‘Links’ in NYC). The first of these InLink units, which will replace some of BT’s existing payphones in the capital, has now appeared on Camden High Street in London (shown below). This entry was posted on Tuesday, June 27th, 2017 at 10:42 @487 and is filed under DailyDOOH Update. You can follow any responses to this entry through the RSS 2.0 feed. You can leave a response, or trackback from your own site.